Interior design in Westfield, NJ is characterized by sophisticated, suburban charm. Strong elements like natural wood and stone are often present in the area’s architecture, and homes are renovated for families who work in or near NYC, but are looking to raise children outside of Manhattan’s busy neighborhoods. Westfield, New Jersey homeowners love their peaceful, natural surroundings and easy access to downtown’s lively scene: a true combination of the best of both worlds. One of my favorite interior design projects—a traditional colonial—is located in Westfield. The couple originally reached out to me while living abroad in Switzerland to help them create the home of their dreams from the ground up. A few Skype calls and lots of emails set the tone. We drafted plans and began our journey of creating a soulful, rustic, and elegant suburban adobe suited to a growing family. The next time the couple were in town, we visited the site of their future home. 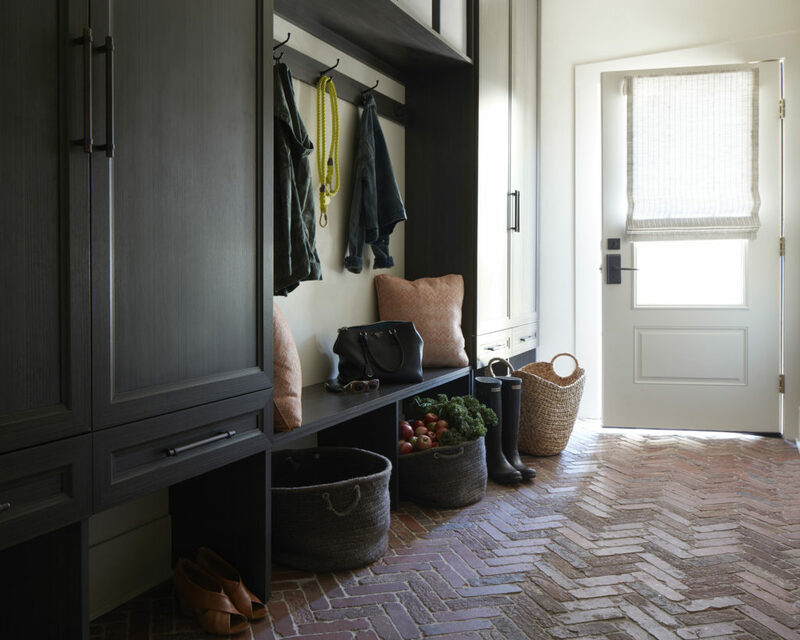 The mudroom shown above features brick flooring that can stand up to New Jersey’s cold, harsh winters, and ample storage for the family’s young, active kids. On any given day, one can find sneakers, sports gear, backpacks, and more, all neatly organized in these built-ins. I love the flood of light that spills in from the mudroom entrance. The first floor powder room is small, but highly trafficked. 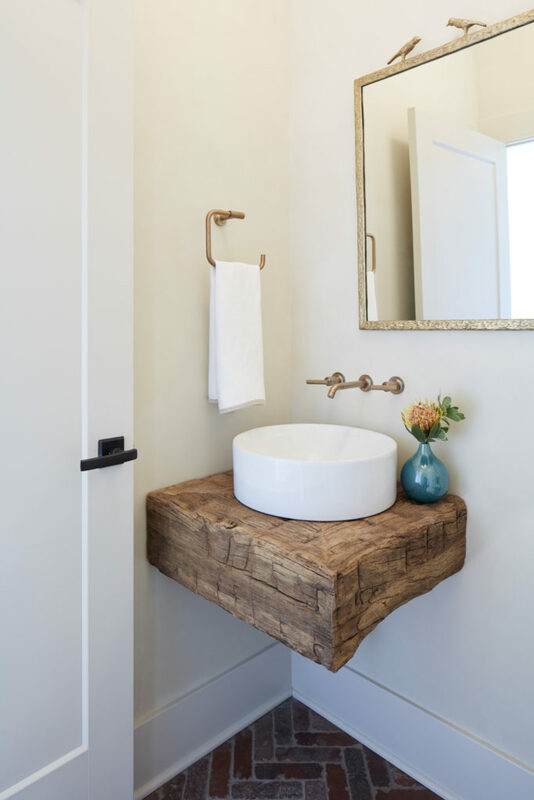 Reclaimed wood acts as the floating sink base, contrasting beautifully with a crisp white sink, brass accessories, and a textured mirror by Made Goods. 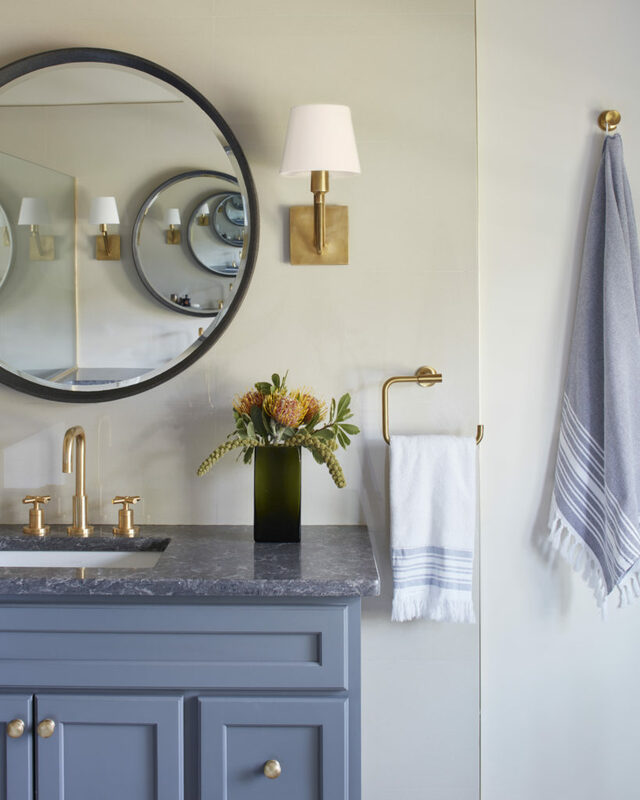 I’m a big believer in the power of a well-designed powder room, and this one sets a calm, soothing tone for the rest of the house. 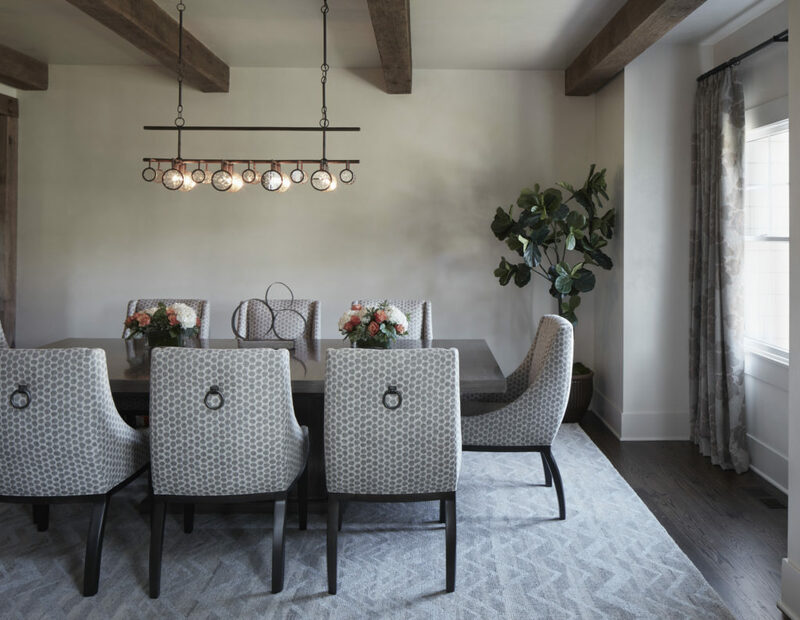 The home’s family room features lighting by Hubbardton Forge, a strong coffee table by Lorts, plush Vanguard sofas and armchairs, a Moomjy rug, custom-made pillows with Romo fabric, and window treatments by Window Works. 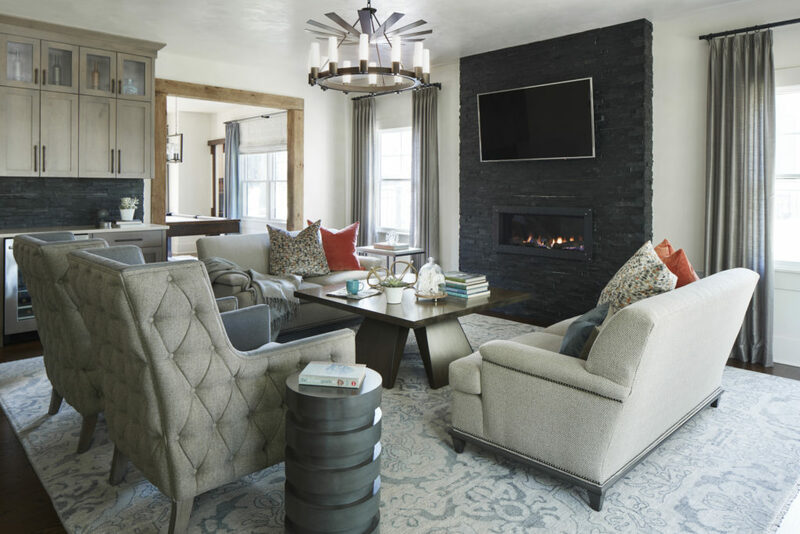 The custom wine fridge is a favorite for entertaining, and the family loves settling into this room and cozying up to the fire on chilling evenings. Sleek, streamlined accessories add interest to the coffee table, and make for great conversation pieces. The kitchen is a true highlight in the space. 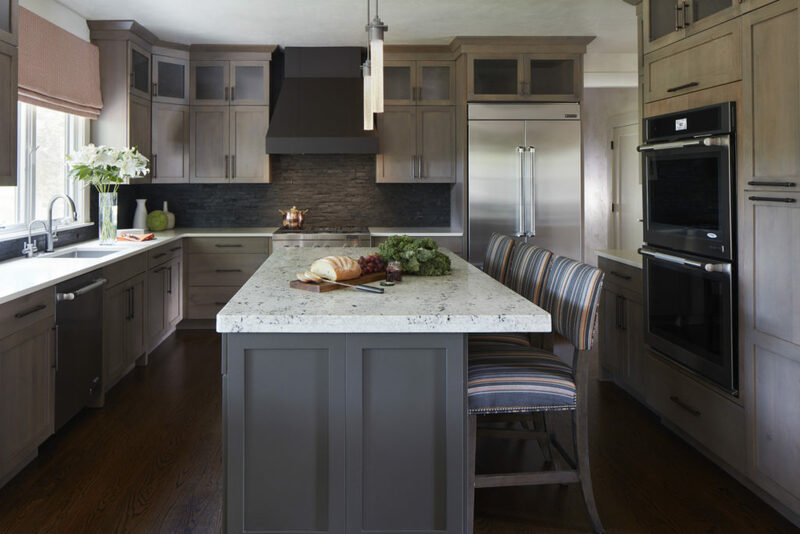 Both functional and fashionable, it features Hubbardton Forge pendant lights, a granite island with custom-upholstered stools, and state-of-the-art appliances. The eat-in-nook is perhaps my favorite corner of the house, as it is both peaceful and vibrant (the banquette was designed with the window light in mind). 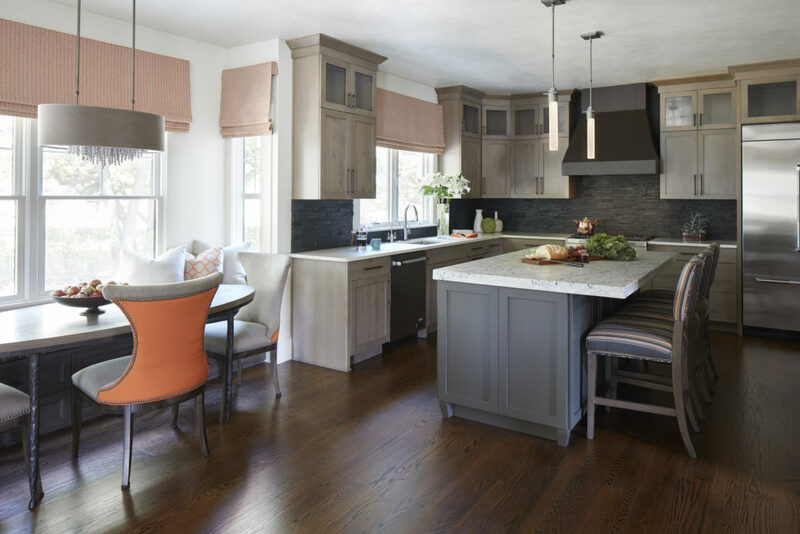 Pops of orange in the Vanguard nail-head chairs, a custom-made banquette seat, a wood dining table from The Old Wood Co, and Window Works Roman shades add a touch of modern glam, as does the Hubbardton Forge chandelier. This is the place to be. 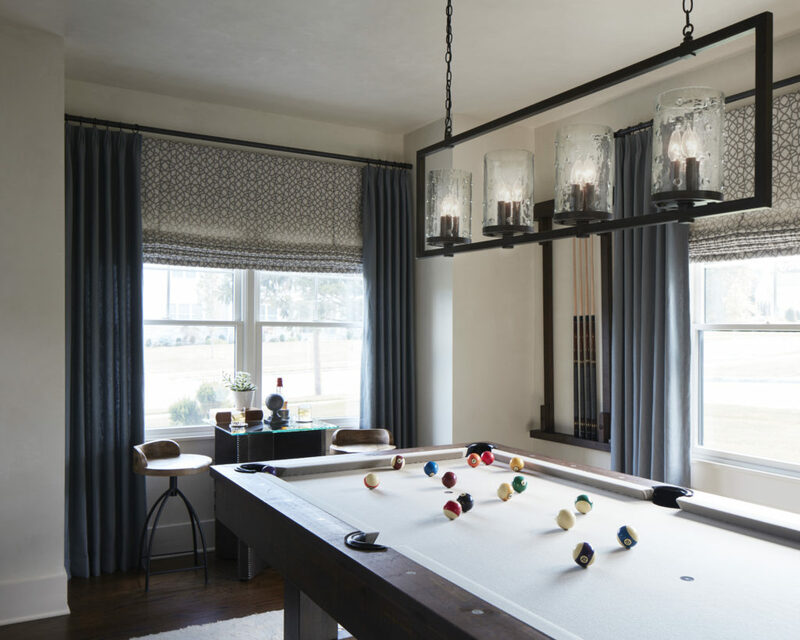 Directly off the living room is a billiard room designed for the whole family to enjoy. Arteriors stools and Vanguard’s Bistro table are ideal for sipping scotch (or Shirley Temples if the kids are playing!) between games. 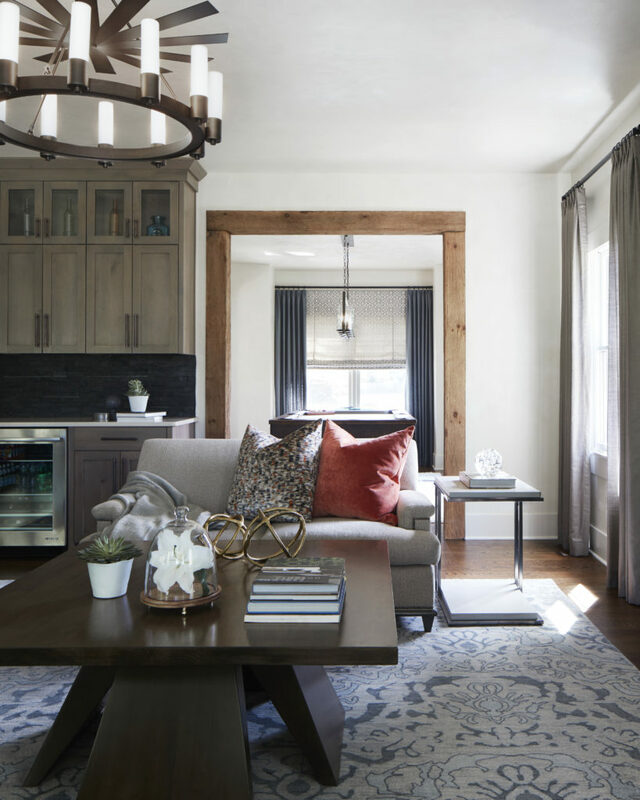 I chose a gothic-inspired Currey & Co. light fixture to tie in with the rustic beams and pool table, and injected some airiness with Norbar’s dusty blue drapes and the homeowners’ own rug from their planet-hopping days. The clients wanted a space that was calming, sophisticated, and elegant. 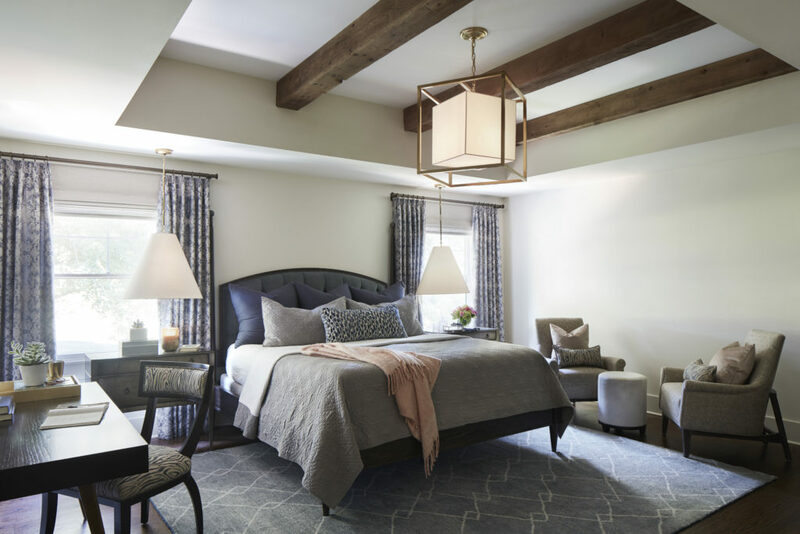 To create this look, I selected a Vanguard bed and side tables with Pollack‘s “fusion-splash” drapery panels and pendants by Circa Lighting. I created a seating area where the husband and wife could settle into Vanguard chairs to read or chat about their day. A Mr. Brown desk and Bernhardt chair make for a great space to jot a note or get organized before facing the day. The room is anchored by a plush rug and statement-making Visual Comfort pendant light. This sanctuary truly represents our clients’ taste and style. 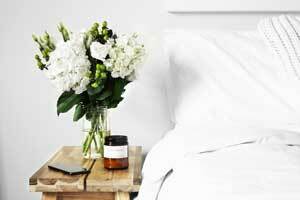 A dream master bedroom is usually complemented by an incredible master bathroom. 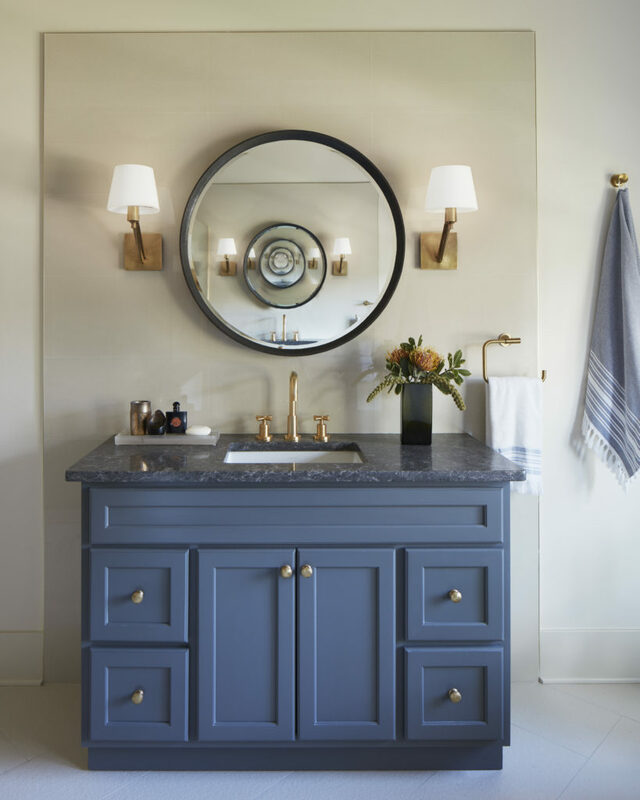 Here, I juxtaposed gold faucetry, accessories, and Visual Comfort sconces against stone countertops, painted cabinets, and an open-plan shower with bench seating. 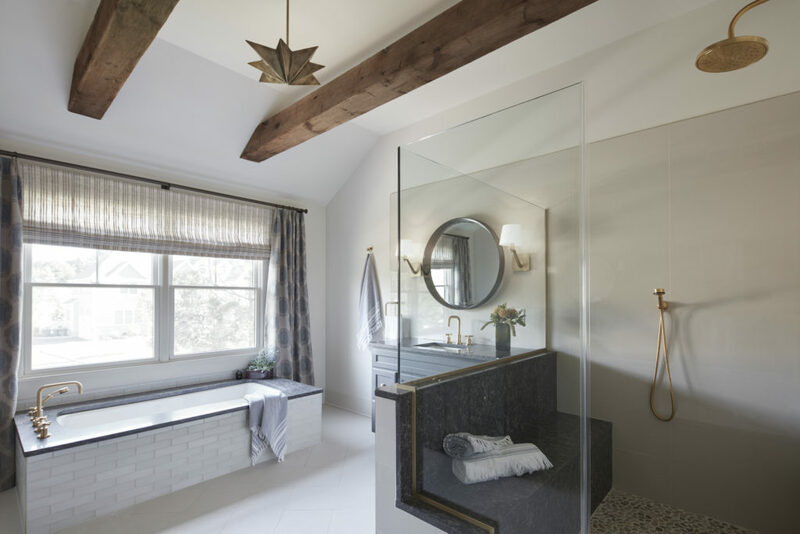 The rustic beams continue to flow through the house, offsetting modern, glamorous touches and tying all of the rooms together with a down-to-earth vibe. The star light by Arteriors is a major focal point without distracting from the clean, calming feel of the space. Speaking of those incredible wooden beams, the formal dining room and entryway are made to showcase their natural beauty. A Vanguard table and chairs can accommodate a large party, but the room is intimate enough for a dinner for four. The Currey and Co. lighting fixture casts a reflective glow, and imbues the space with vintage charm. Floor-length drapes blend nicely with the room’s muted tones, allowing whatever is served to take center stage. 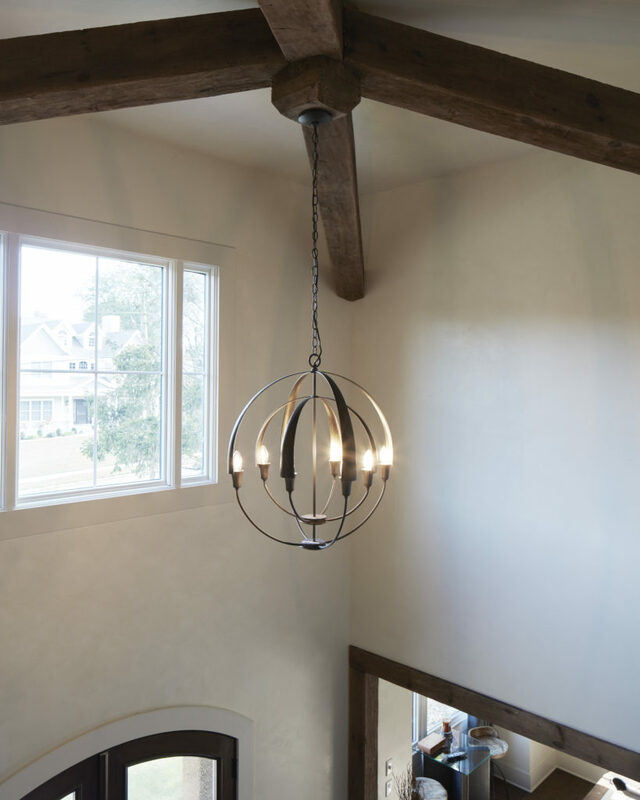 The foyer also features a stunning Hubbardton Forge chandelier. Incredible ceiling heights were ideal for letting the home’s clean architecture and rustic wood details truly shine. As soon as you walk in, you are immediately taken by the house’s grace. The walls are hand-applied plaster finish by Ariana Hoffman. 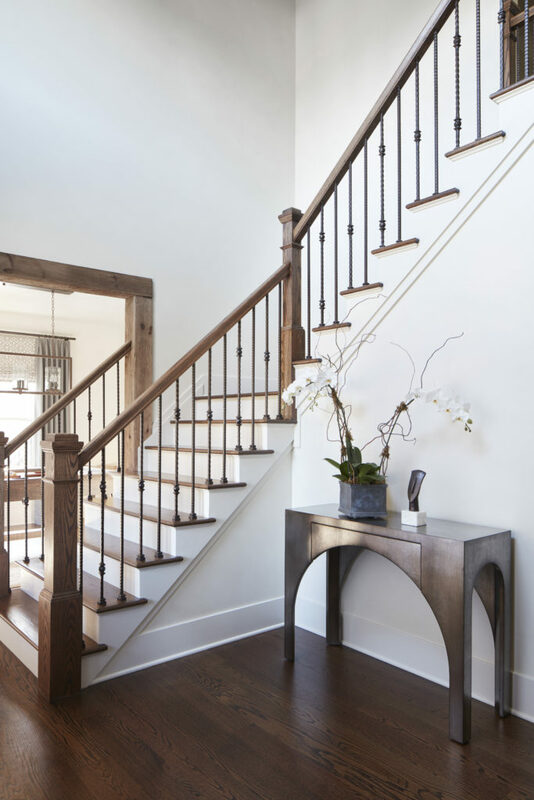 We took a basic spec home, stripped back all the layers of paint-grade moldings, and layered in hand-applied plaster and wood beams to give the home a true sense of place, soul, grit, and instant age. We also stacked slate backsplash and the fireplace iron railing. It was a long process, but one I would do again in a heartbeat. All of your help and ideas have created our dream home. We could not have done it without you. The feeling is mutual. Building a home from the ground up with like-minded individuals is an experience of a lifetime, one that I was lucky enough to be a part of. 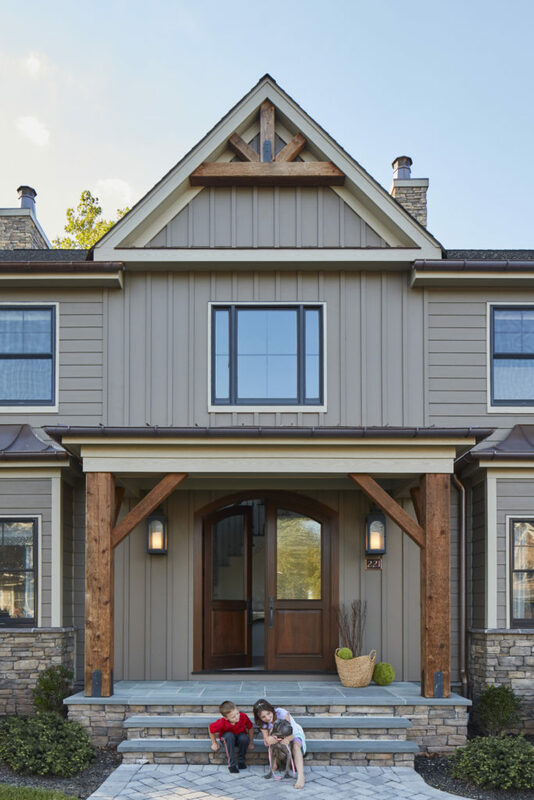 This experience yielded amazing interior design in a traditional Colonial, and an excellent blueprint for building a dream home. What’s so great about Westfield, New Jersey? The area is known for its vibrant downtown district and family friendly neighborhoods. Downtown Westfield was originally referred to as the old village area, and settled in 1720. Today, the town consists of the North Side and the South Side, both peppered with beautiful upscale neighborhoods. The Westfield Memorial Library, founded in 1873, is one of the town’s most beloved landmarks, and is home to 250,000 books (a bibliophile’s dream!). Downtown’s charming line of storefronts offers a mix of independent boutiques and national retail stores that draw a nice crowd year around, and nearby war memorials pay homage to fallen heroes. 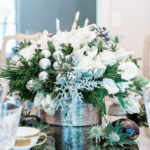 Westfield has a strong and inviting community, and its Newcomer’s Club connects recent arrivals to neighborhood galas, children’s programs, and outreach services. Definitely a top place to live in the Garden State.